Farm Sanctuary called on Avalon to launch an urgent fundraising campaign that used on-the-scene reporting and videos to tell a compelling story and help fund its emergency rescue program. OBJECTIVE: When tipped off that animals were living in horrific conditions on a farm in upstate New York, Farm Sanctuary called on Avalon to gear up for an urgent online fundraising campaign. Because the Hudson Valley Rescue involved 200 animals in perilous health, timing was critical, and Farm Sanctuary staff knew that their Emergency Rescue Fund would be quickly depleted by such an ambitious undertaking. Our objective was simple: to fund the care and safe placement for many seriously sick and diseased farm animals — and replenish the Emergency Fund for the inevitable next rescue. 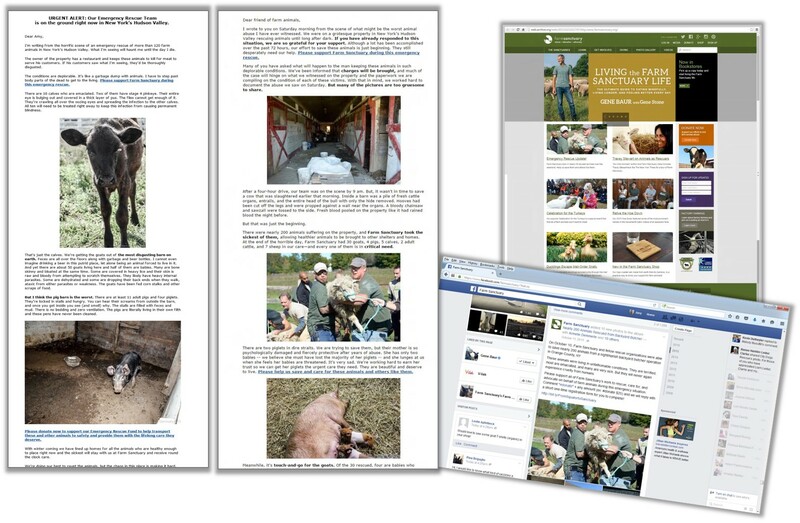 STRATEGY: Once Susie Coston, Farm Sanctuary’s national shelter director, began reporting directly from the farm about the appalling conditions there, we knew that her eyewitness account would be the compelling foundation for our online campaign. The first email in the series ran the subject line URGENT: Emergency rescue happening NOW. In it, Susie described what she was seeing right there, in real time — the pigs, goats, and cows in agony — and how the Farm Sanctuary rescue team was coaxing the traumatized animals into the rescue trucks to receive treatment. We sent the second email 72 hours later with the subject line: RESCUE UPDATE: Case pending; animals still need your help. Susie updated supporters on the condition of surviving animals, the ongoing work to bring them back to health, and how the farmer could be prosecuted. Both emails included heartbreaking photos of the sick animals and the heroic Farm Sanctuary staff in the act of saving them. We also used symbolic asks in both emails, first asking donors to give $120 for the nearly 120 animals we thought FS was rescuing at the time; in the second, we asked donors to give $200 for the nearly 200 animals that were actually rescued. RESULTS: The online Hudson Valley Rescue campaign was a blockbuster success! In fact, it was the highest grossing online rescue campaign Farm Sanctuary has ever sent, with gross revenue up almost 35 percent above the previous best online campaign. A good number of donors followed the symbolic asks, resulting in a strong average gift up 27% from the best previous online rescue campaign. We also included coordinated #donate asks on Facebook to gauge its effectiveness. These posts resulted in a 67.66 percent fulfillment rate (better than the standard 59% completion rate quoted by GoodWorld). Post campaign, stewardship was key to retaining the new donors who came in through the rescue campaign—beginning with a thank-you email and video with updates about the animals.